The Harvil Hydraulic Rowing Machine features an adjustable hydraulic resistance system and has a space-saving design of foldable arms. It is a compact rower when fully assembled and it also allows you to fold it up when it is no longer in use so that it occupies a very limited storage space. Before we go further with this review, we thought it might be helpful if we informed you that the Stamina Body Trac Glider 1050 Rowing Machine is a similar rower that has got a very good track record of usability and popularity and might even be slightly cheaper than Harvil Hydraulic Rowing Machine. Moreover, if you are interested in a hydraulic rower with additional workout capability and willing to pay a little more, then, you may want to look up the ProGear 750 Rower. That said, the Harvil Hydraulic Rowing Machine holds its own since the majority of the users that reviewed it on Amazon has done favorably so. It is slightly compact than the suggested rowers above and can accommodate users of different heights. However, users that are above average height may not be able to row with full leg extension. The rower’s hydraulic resistance system provides challenging workouts because it could be manually adjusted for different resistance strength. It has a large 11 inches pivoting, anti-slip designed footrests with adjustable safety straps that provide flexibility, security and accommodate different foot sizes. The frame is made of durable steel and can support 250 pounds/113 kg maximum user weight capacity. It has a basic console that features easy to read LCD monitor that tracks time, row count, and calories burned. The large, padded and contoured seat graciously and smoothly glides your every motion. Click right here to have a peek at the discounted price of the Harvil Hydraulic Rowing Machine on Amazon. The Harvil Hydraulic Rowing Machine is mostly made up of durable steel and that includes the frame, the rowing arms, and the stabilizers. 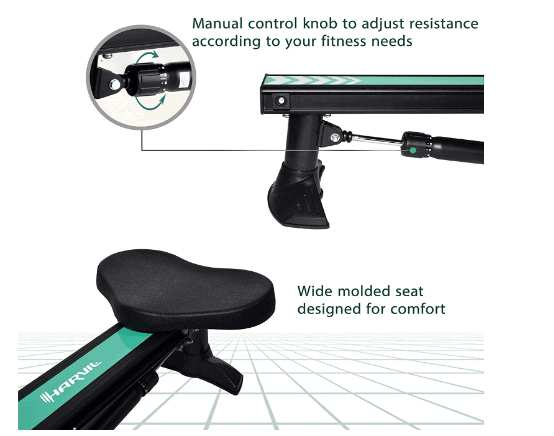 The rower also features fewer ABS plastic materials that are mainly for cosmetic reasons. The metal parts are coated with anti-corrosive and scratch paint that ensures their degradation is prevented. The Harvil Rower supports 250 pounds/113 kg maximum user weight capacity and has a 35.4 inches long rail that could accommodate users of different heights. However, users taller than 6’ may experience the inability to fully extend the legs during a workout. It has a very good base framework that establishes good stability that supports intense and vigorous workouts. As aforementioned, the unit is not large as other rowers with magnetic, air or water resistance system. It has overall dimensions of 50 inches long by 36.22 inches wide by 20 inches tall. This means that it will need a workout area of 4’2’’ long by 3’1’’ wide. That said, additional clearance of 1 foot at the rear and on each side of the rower will be necessary for safe and comfortable rowing experience. The Harvil Hydraulic Rowing Machine is a full body cardio exercise machine integrated with folding arms that provide a full range of motion that targets different muscle groups during a workout. The Harvil Hydraulic Rowing Machine features a molded seat that is large, padded and covered with a vinyl material. It’s attached to a rail frame that consists of ball bearings that provide smooth and easy gliding motion, and indeed, it glides smoothly. The seat is strong and durable but not very comfy as some users have noted. The manufacturer has pledged to improve on the seat’s comfortability but for the meantime, you can use a gel seat cover to enhance it. The seat’s dimensions are 9.5 inches long by 14.5 inches wide by 1.5 inches thick. The rower is equipped with folding arms that are ergonomically designed to provide the full range motion required for all the upper body muscle groups to be engaged. The handles grips are also coated with soft rubber material for optimum comfort and secure grips. Therefore, no slippage or blisters in the palms will be experienced and you should be able to work out longer without feeling sore or bored. The rowing arms allow you to row back and forth in a circular motion that mimics the use of the real oar in the water. Moreover, just as it has been said, the arms are foldable. They can easily be folded up when you need to put the rower away for storage. The footrests are anti-skid designed, 11 inches large, with adjustable safety straps that have two interchangeable positions for maximum comfort and security. The footrests are pivotal and have borders at the heel part of it so that the feet can further be secure and in place during intense workouts. 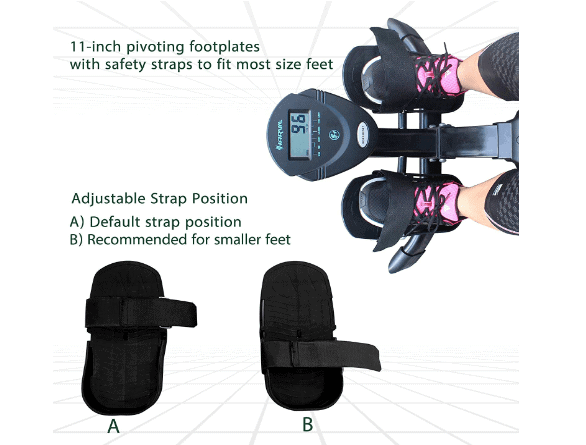 The interchangeable safety strap positions make it possible for bigger and smaller feet to be accommodated conveniently. The Harvil Hydraulic Rowing Machine is integrated with a hydraulic resistance system that consists of a hydraulic cylinder with an adjustable knob that is connected to the arms. The adjustable knob allows you to increase or decrease the resistance strength. There are no pre-defined resistance levels available; you simply adjust until you feel you have the suitable resistance strength for your workout. Its general operation is smooth, quiet and effective. However, the resistance provided by this rower is suitable for beginners, intermediary users and generally for everyone else whose goal is to lose weight, maintain or improve the overall physical well being. You can put this rower in front of the TV and watch your favorite show as you workout, and the family or the neighbors won’t be disturbed by your activities. The resistance system doesn’t require any maintenance. As expected, the rower is equipped with a basic console that features an easy to read LCD monitor. This monitor displays and tracks time, row count, and calories burned. It also has the SCAN function that is responsible for rotationally displaying the workout values one at a time every few seconds and continuously. You may also set a certain preferred workout value to display constantly without shifting to another. The monitor is not backlit and therefore, its readability will be compromised if viewed in an environment that is not well-lit. The monitor is powered by an AA battery which is not included in the package. The Harvil Hydraulic Rowing Machine doesn’t feature any accessory. You must improvise to keep water handy during workouts in order to stay hydrated throughout the entire workout session. The storage of this rower is easy and doesn’t take up much space because it folds up. It takes very minimal space and could be stored against the wall or in the closet but not under the bed. It is a lightweight machine that weighs 34 pounds/15 kg and therefore can easily be moved around from one room to another even though it doesn’t have any transport wheel integrated into it. The Harvil Hydraulic Rowing Machine is obviously a popular rower, at least that’s what it seems like on Amazon. It has tens of Amazon customers’ reviews and they are all positive and the users suggest it was a good investment considering the price and the value of the rower. 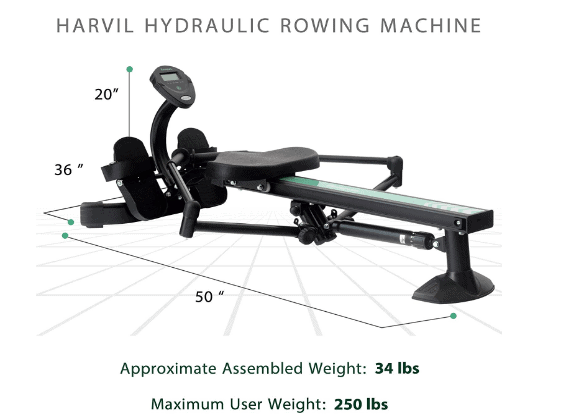 The Harvil Hydraulic Rowing Machine is shipped in a box with dimensions of 50.5 inches long by 11.22 inches wide by 8.66 inches tall and it’s 38 pounds/17 kg in weight. The shipping cost depends on the shipping policy of the vendor you are purchasing from. However, Amazon provides free shipping and delivers the product within days of order. The assembly of the Harvil Hydraulic Rowing Machine is simple and easy. It comes with an instruction manual that explains and walks you through the process of the assembly. The tools needed for the assembly are also included in the package. The assembly time might be 30 minutes, more or less. No major maintenance is needed for the Harvil Hydraulic Rowing Machine. Any part that is damaged will be replaced by the manufacturer within the warranty period. All you need to do in order to keep the unit in a good working condition is to always examine it before for any loose or broken part. Also, make sure to keep it clean from dirt and sweat before and after workouts. The Harvil Hydraulic Rowing Machine is a cost-effective compact low impact cardio rower that allows you to do your thing in the comfort of your home or office. It is handy and can easily be handled without stress or hassle. 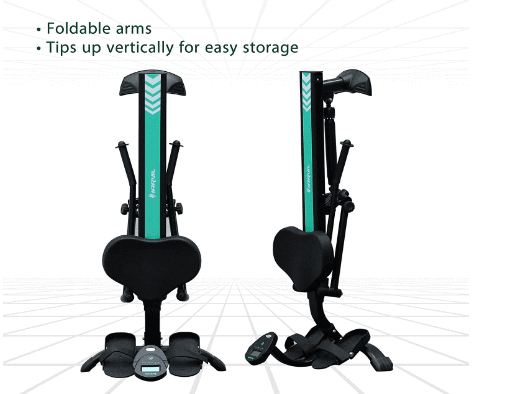 The foldable arms provide full range motion that mimics the real oar movement in the water and also engages multiple muscle groups during a workout. This rower is far from perfect but it possesses the quality to make your workout session productive.